How I think about slowness, and about my life list of things I’d like to make, has changed pretty dramatically lately. 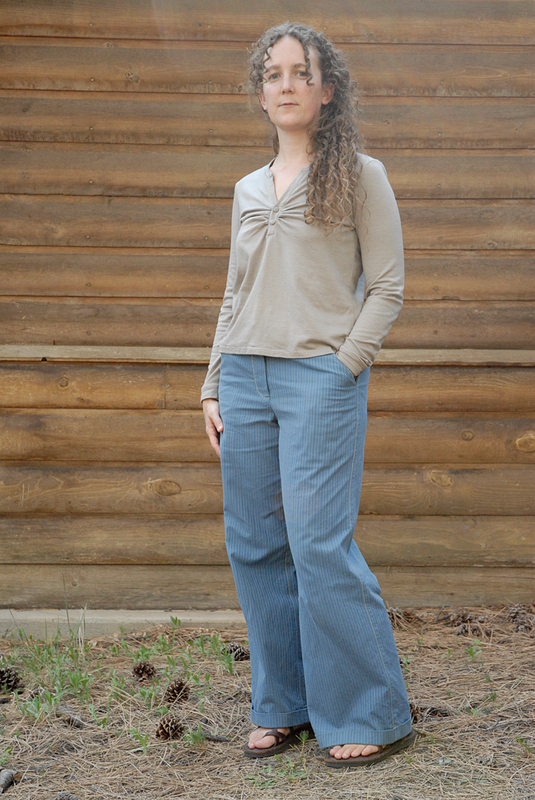 I’ve been wanting to talk about it here, and Slow Fashion October has given me the perfect reason. It started when I learned to spin. Then a little later, I realized how much I really could make, and how little I really needed. That feeling built, fed by the other things I was doing and reading, until the vast universe of possibilities suddenly felt expansive instead of overwhelming. 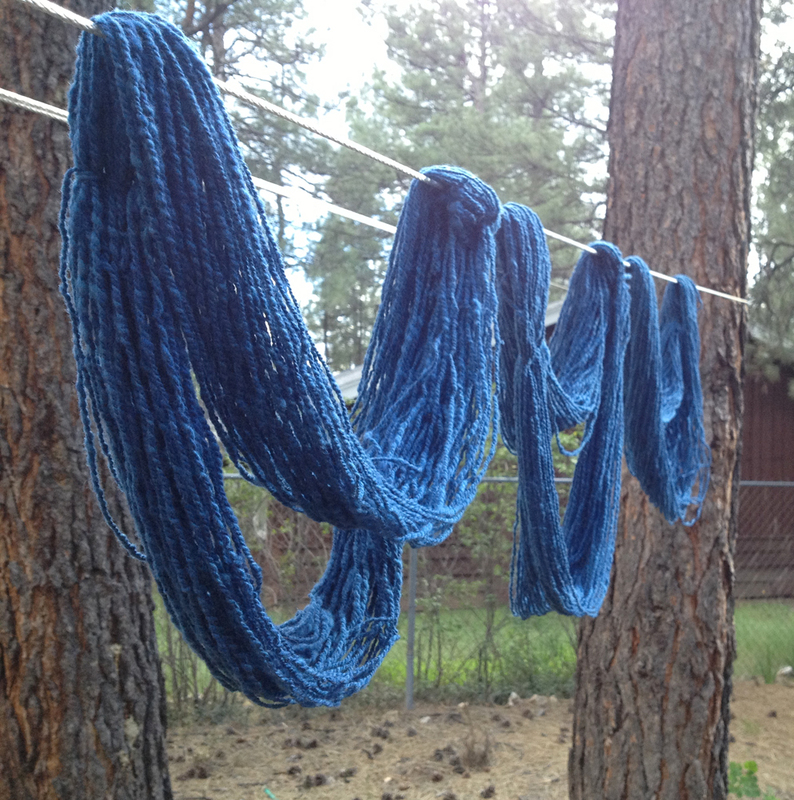 This is apparently the only picture of my second batch of handspun before knitting. 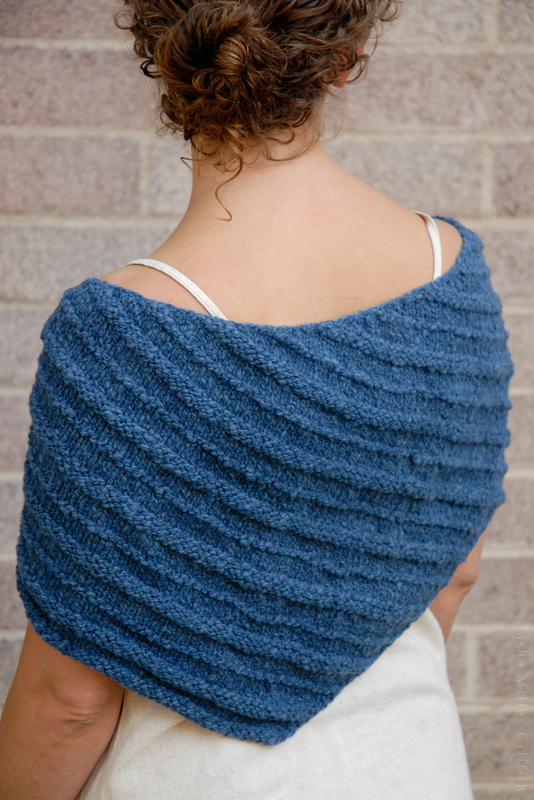 You wouldn’t think that learning to spin would speed up my knitting, but it kind of did. 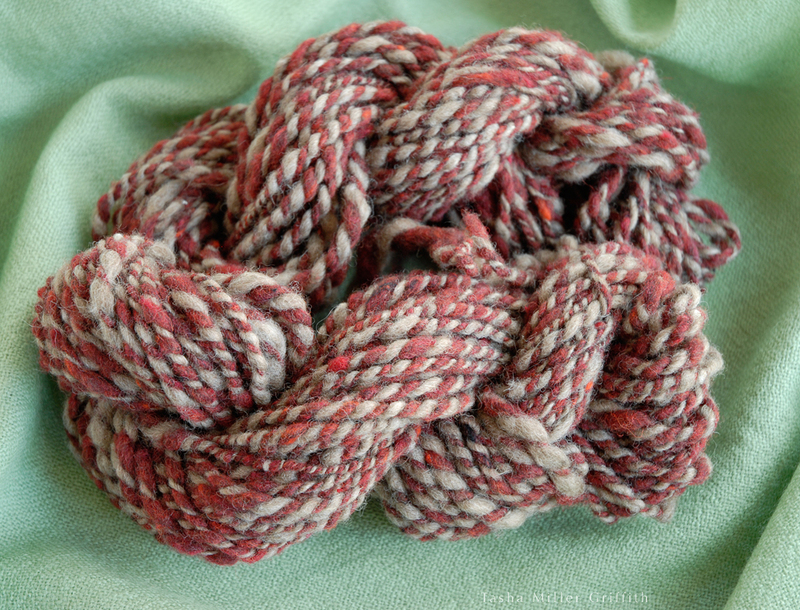 The two batches of handspun I’ve made so far have gone pretty much straight to the needles, partly because I was so curious to see what I would learn by making something from my own yarn. 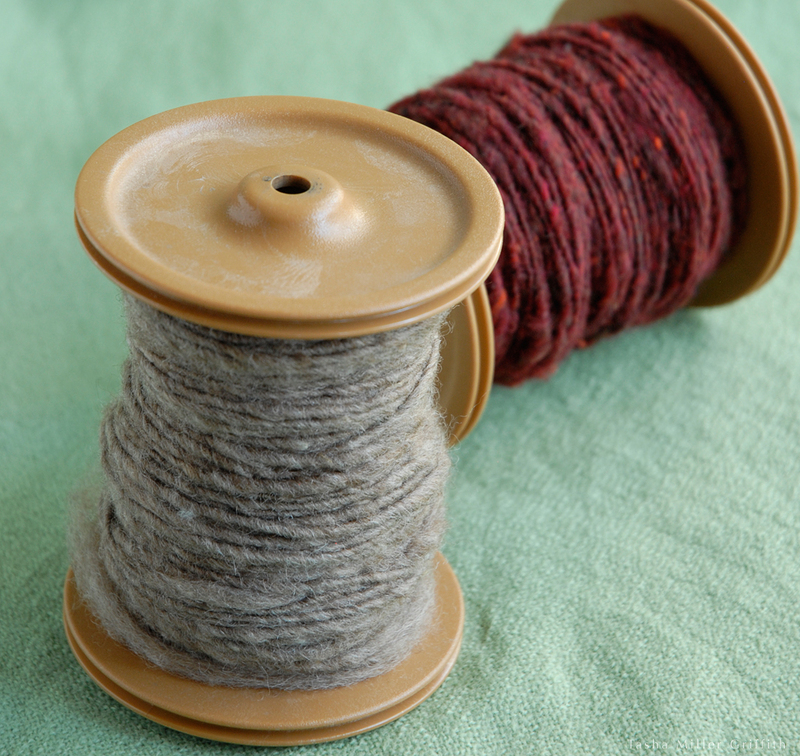 So one thing was obvious from the start: I can spin all the yarn I need to knit with. 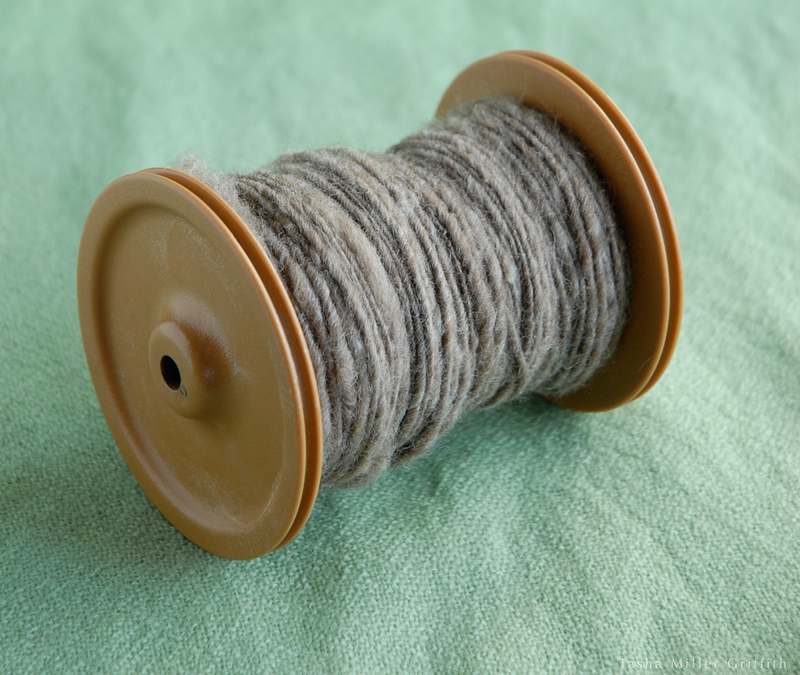 In fact, if I spun even a little bit every day, I would end up with much more yarn than I usually consume. 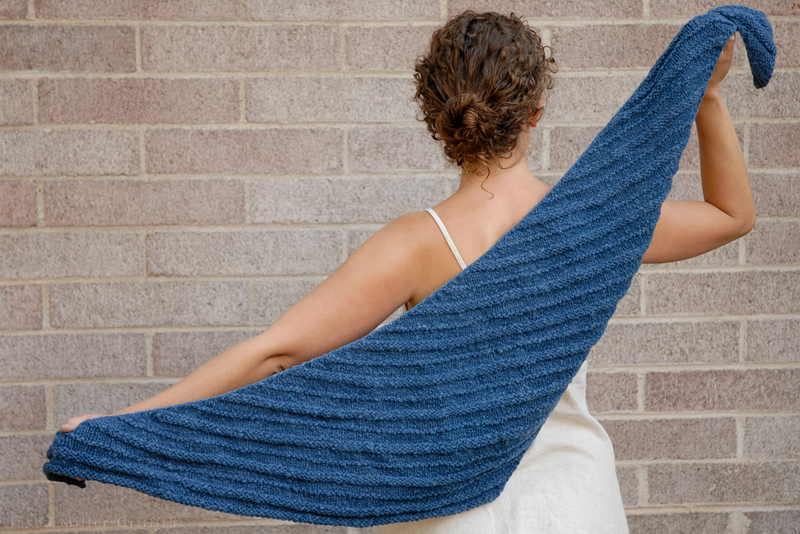 It became a Quaker Yarn Stretcher Boomerang, a fantastic fit for the yarn. 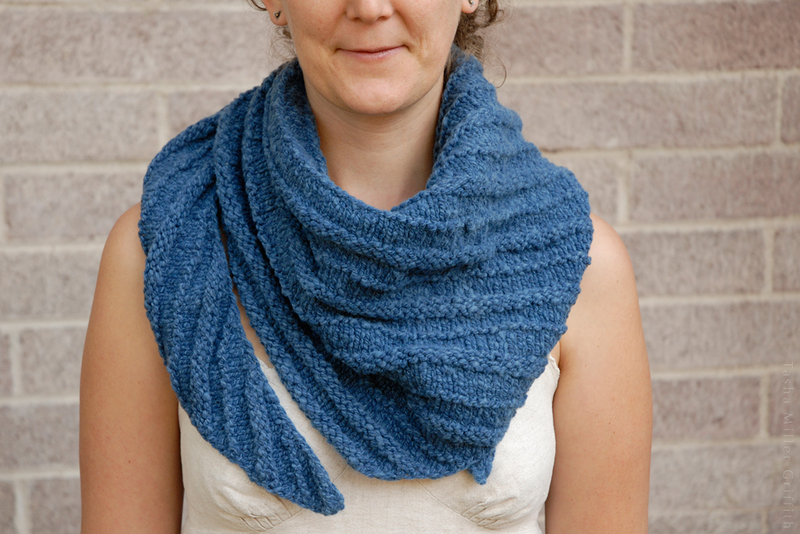 I’ll post Details are now on Ravelry, but for now I want to focus on the thoughts. So need, or maybe it would be more accurate to say lack of need, is a big part of this shift in my head. I find it incredibly helpful and freeing, and it goes something like this: if I already have most of what I really need for this winter, I’m free to spend my time making something really special (no matter how long it takes) or trying something new (ditto). What I don’t know how to explain (in fact I’m not sure I’m explaining any of this very well) is why spinning in particular set me free from the desire to make all the things, but here I am. Of course, if I didn’t spin it would still be perfectly valid (maybe even more so) to say, “I have the capacity to make so much more than I will ever need.” In fact I think maybe every maker should say this, and see how they feel about it. I know that time always seems short. I have struggled and struggled with that myself. But I’m coming closer to peace with it, and for me anyway, it doesn’t really have anything to do with productivity, with figuring out how much I can “fit” into a given time, how much I can accomplish or make. Ultimately, a good life isn’t about how much we do. It’s about what we do, what’s memorable, how we shape and enjoy our experiences. 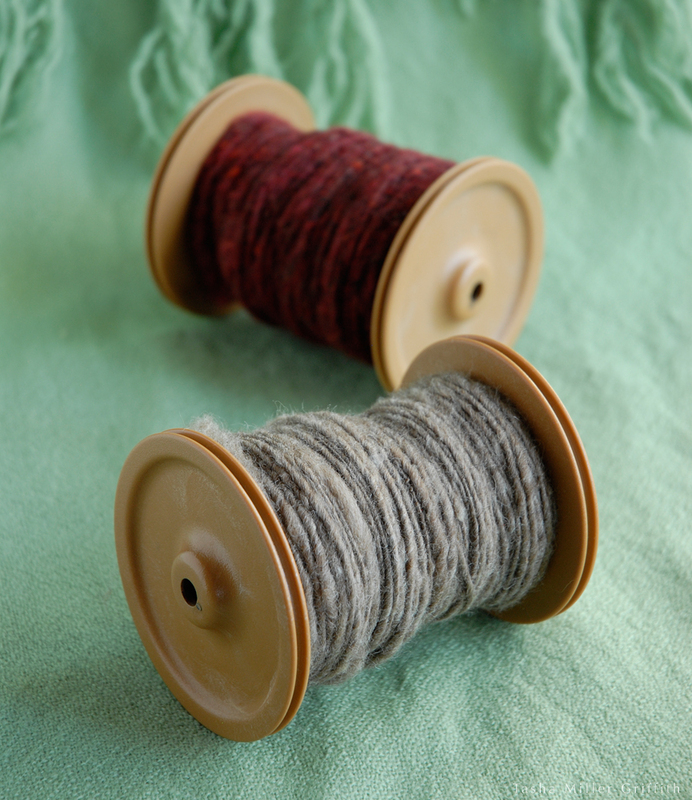 In theory when we decide to sew or knit something instead of buying it, we’re taking more time about it and being more thoughtful. But somehow pursuing a craft can also pull us into a spiral of wanting to make more and more, of making something just to finish it and go on to making something else, because we have so many ideas. Thinking about everything I’d like to make leaves me perpetually unsatisfied, as it always must, since I can think of about a dozen new ideas per day. Framing my making around what I need allows most of those ideas to pop up, get admired, and then just float away. Lovely though ideas are, they should not all be added to a perpetually growing list of things I “must” make. Ironically, giving up on making all my ideas for the realms I usually work in (mainly clothing) may leave me time to take on things in my wildest crafting dreams. Try making shoes? How about a quilt from those passed-down handwoven scraps? Well if I’m content with what I have to wear for the moment, why the f#^k not?! I’ve been thinking a lot lately about all kinds of ideas around slowness. I listened to an interview with William Powers and I’m convinced I need to read his new book New Slow City. One thing he talks about is taking time to fully have an experience, just focusing on what you’re doing instead of already planning the next thing you’re going to do after it. I want to do craft like that. This week, I’ve been in the final stages of refinishing a treadle sewing machine cabinet, a project I have probably a months’ worth of total work hours sunk into. Just doing that, and thinking about nothing but that, running my hands over the velvety smooth wood and mulling over all the steps that got me there, it was so incredibly satisfying. Much more so than finishing four little projects and for each one just thinking “oh good, that’s done,” and moving on. Letting go of a lot of my ideas does feel like somewhat of a surrender, but it feels like the kind when the heat of the day won’t let up, insects drone on, and finally there is nothing for it but to peel off whatever clothes are handy and throw yourself into the nearest body of cool water. Or the end of a long winter day, when nothing feels better than to pull warm cozy blankets all around you, and let your whole body relax. 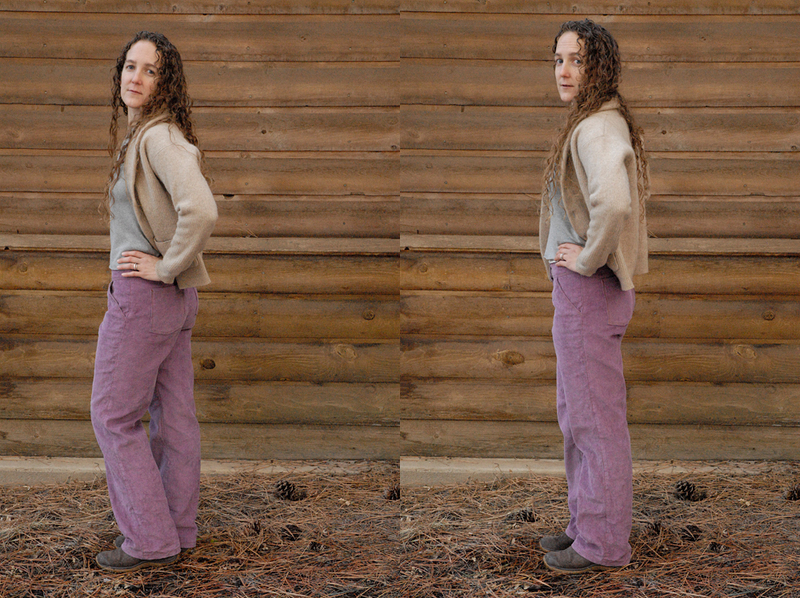 So here’s what slow fashion means to me right now: it means I will make just a few things at a time, and I will make them with my whole heart. It means I will allow ideas for things that I don’t need to float away, and concentrate on the projects that mean the most to me and those that will be the most useful. It means I will give myself space to enjoy the processes, the parts that bring me the most joy (like spinning) without worrying about what’s next on the list. And I think it will mean that the more I make in this slow way, the more I will wear my heart on the outside, all over my body. 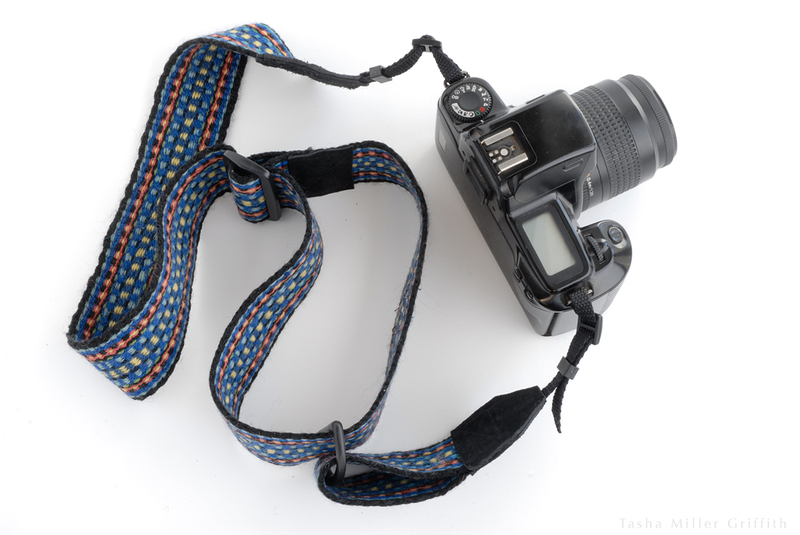 How to make your own camera strap, using the same hardware and webbing you’d find on one at the photography store, and practically anything you want for the strap! When I got my new (used) camera, I just carried it around in the crook of my arm for quite a while, because I knew exactly what I wanted for a strap, and I couldn’t find it in any camera shop we visited. The new camera is heavy (by my standards anyway) and I did not want a thin strap that would dig that weight into my neck all the time, I wanted a wide soft strap that would cup around my shoulder and hold the weight there. I got this idea from Cat Bordhi (have I mentioned that she’s a mad genius?) 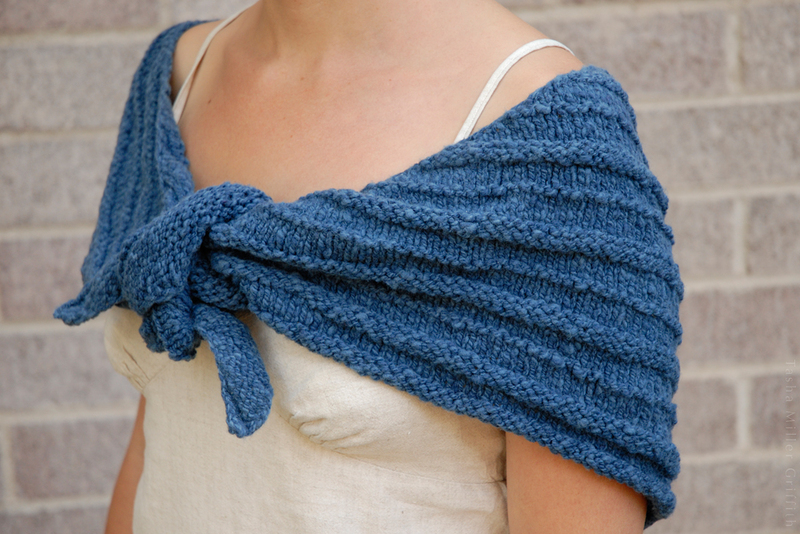 specifically from knitting one of her mobius sling bags (in A Second Treasury of Magical Knitting), and it stuck with me. I got the 3/8″ webbing and hardware to go with it from SewingSupplies on Etsy. She made me a package deal like this one, which includes enough supplies to make two straps (each end of a strap takes one piece of webbing, one slider and one keeper). I’m assuming that your camera has a ring or loop which 3/8″ webbing will fit through (most do, but some small point-and-shoots don’t. You might be able to substitute something lighter, I would take your camera to the fabric store and see what you can find). 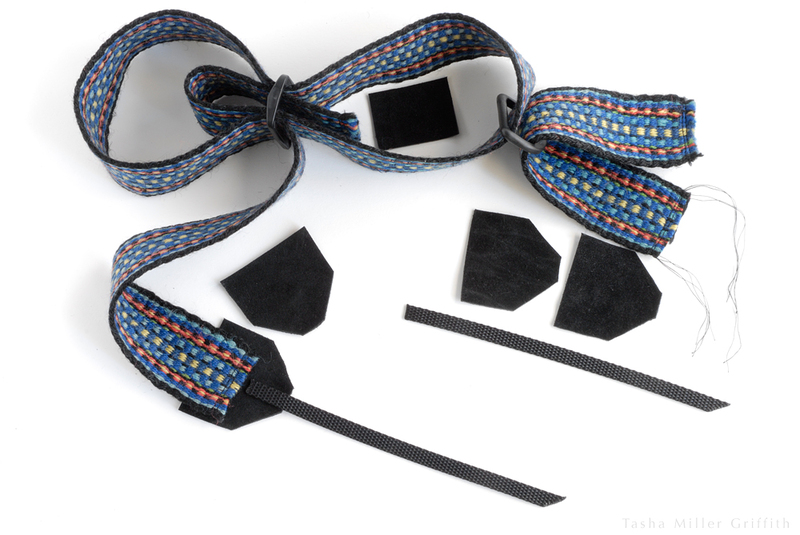 You will also need sturdy material for ends of the strap, where the strap meets the webbing. I used Ultrasuede (faux suede leather) for my strap (above), and some scraps of real leather on a strap for my dad (the one at the top of the post). If you want your strap to be adjustable, you’ll also need one slider and one loop of hardware, in a size that works with your strap material. 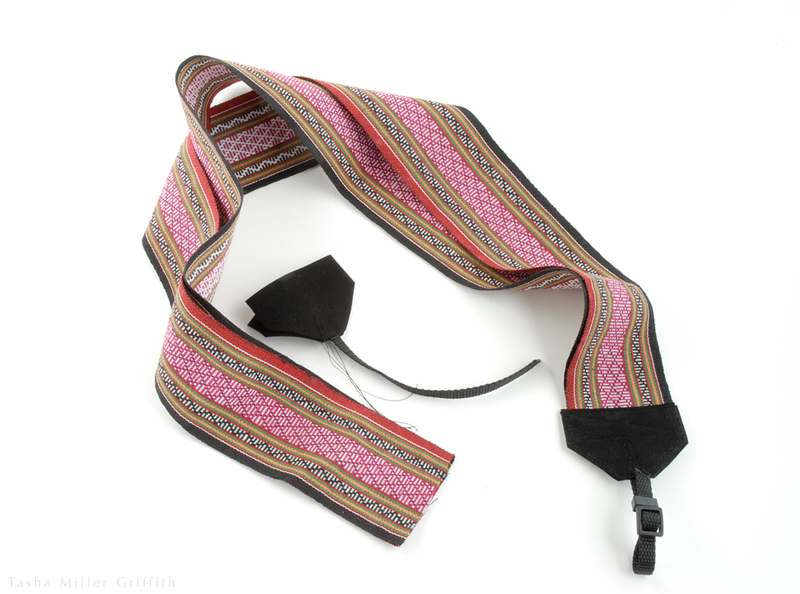 My strap is cut from a length of soft cotton textile woven about 2 3/4″ wide, which was in my mom’s stash. I suspect that my parents brought it back from somewhere in their travels in the 1970’s, but neither of them remembered where, and they both said I could use it, so I did. Dad’s strap is one his mom (my grandmother the weaver) made, which I put new ends and a slider on. I found some similar straps by searching for “handwoven band” or “handwoven strap” on Etsy. 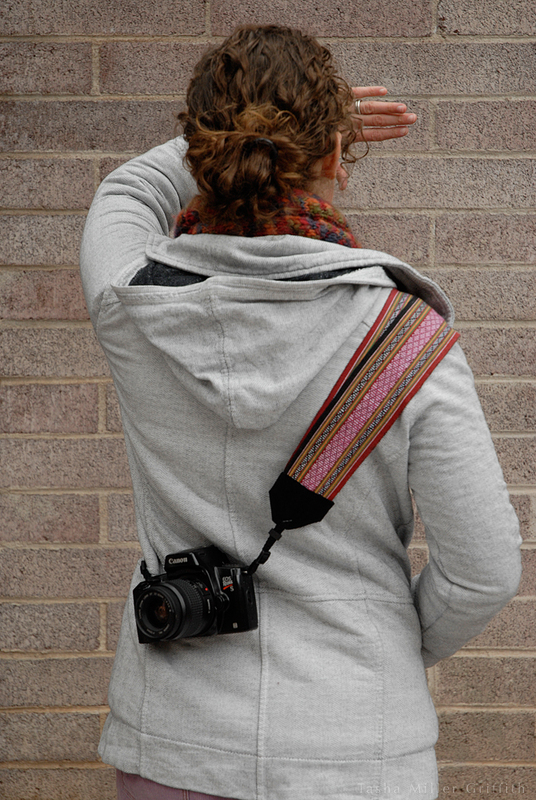 You could also start with a belt, or a guitar strap or anything else you like, as long as it’s sturdy enough to hold your camera and thin enough to sew through (which leather belts aren’t. 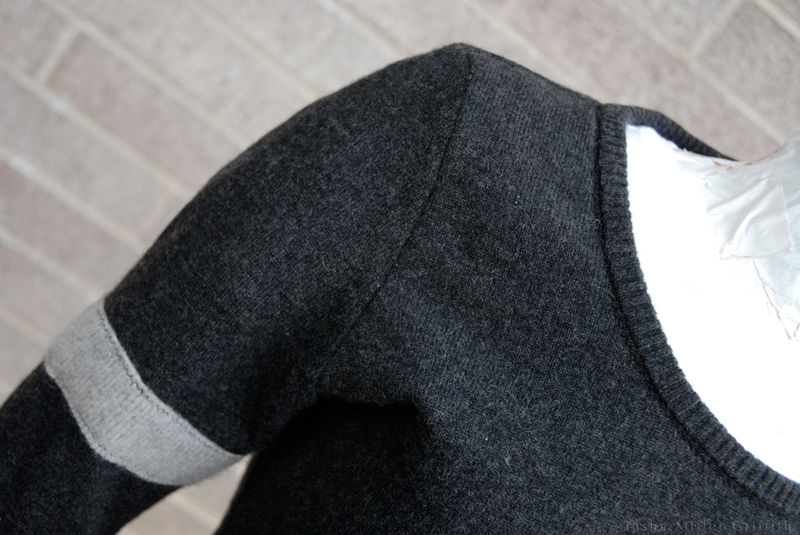 You might be able to use rivets though …). Cut pieces for the ends from faux leather or leather, a bit wider than your strap (allow extra width if your material is thick, so that it can come together and cover the edges of the strap), continuing that width for about an inch, and then tapering to an end to cover the webbing. See below to visualize how the ends cover the strap and the webbing. You will need two leather end pieces for each end of the strap (four total). 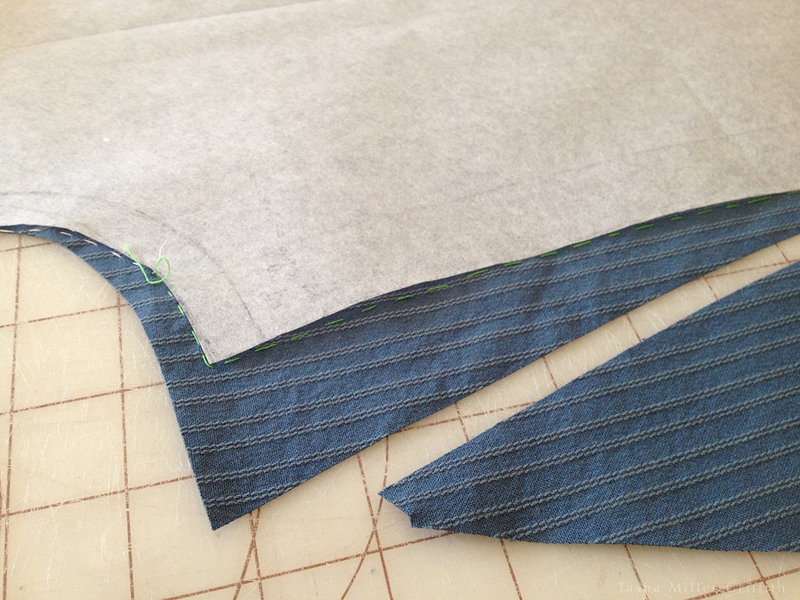 Cut a piece of the 3/8″ webbing about 7 1/2″ long for each end of the strap. If you cut the ends of the webbing on a slant, it will make it easier to thread them through the slots on your camera. I like to sear the cut edges of the webbing (to keep them from fraying) by passing them quickly through the blue part of a candle flame. 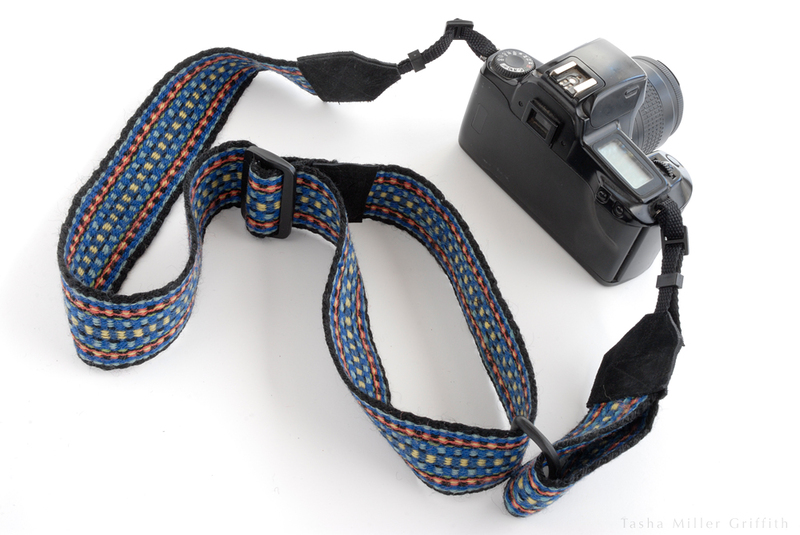 Either figure out where you would like your camera to rest on your body and cut the strap to that length (accounting for the ends and webbing) or plan to make your strap adjustable. I knew exactly how long I wanted my strap to be (so that the camera would rest on the top of my hip), but I made Dad’s so he could adjust it (keep reading for how to do that). 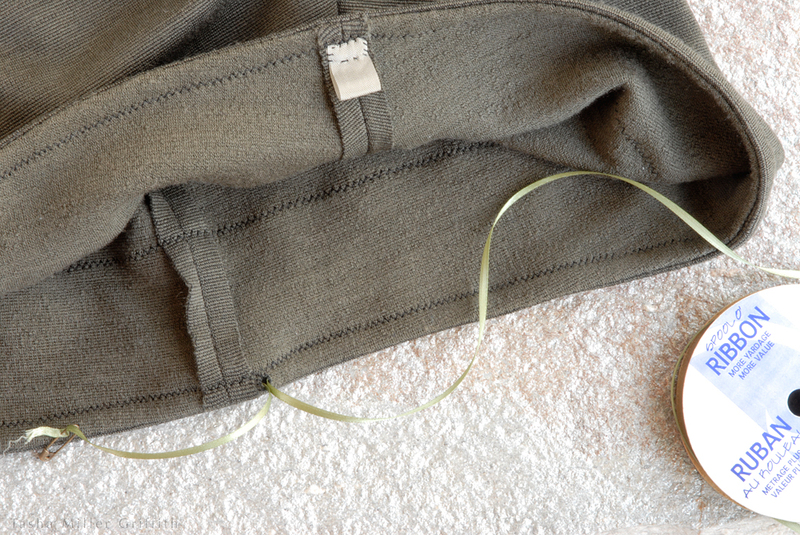 If your strap fabric is prone to fraying/spreading out all over the place, you may want to stitch over the ends before putting everything together. You can even use that stitching to gather in the end of the strap a bit, which I did for Dad’s strap. Sewing the strap is actually pretty simple, it’s all about how to join two things which you really don’t want to come apart. My camera is the second-most expensive and precious piece of equipment I own (sewing machine being #1 ) and as I said it’s kind of heavy, so I definitely want some heavy duty stitching here! 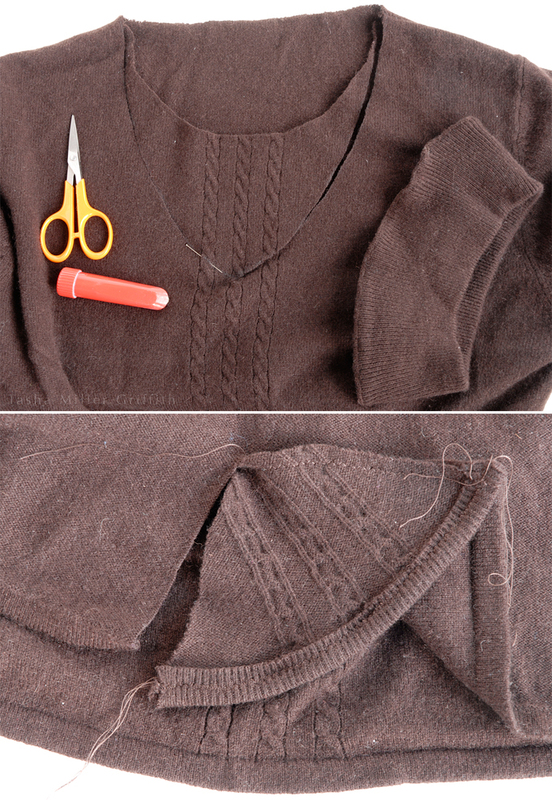 Basically you’ll do this by adding extra stitches to reinforce the critical areas. 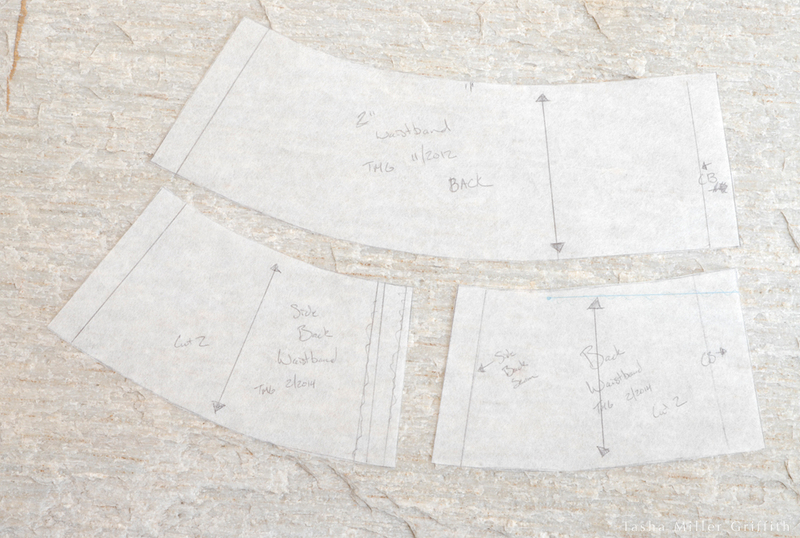 A good way to attach straps for extra strength is to sew a rectangle-and-X pattern (I just realized I have no idea if there’s an official name for this … but here’s how to do it anyway). 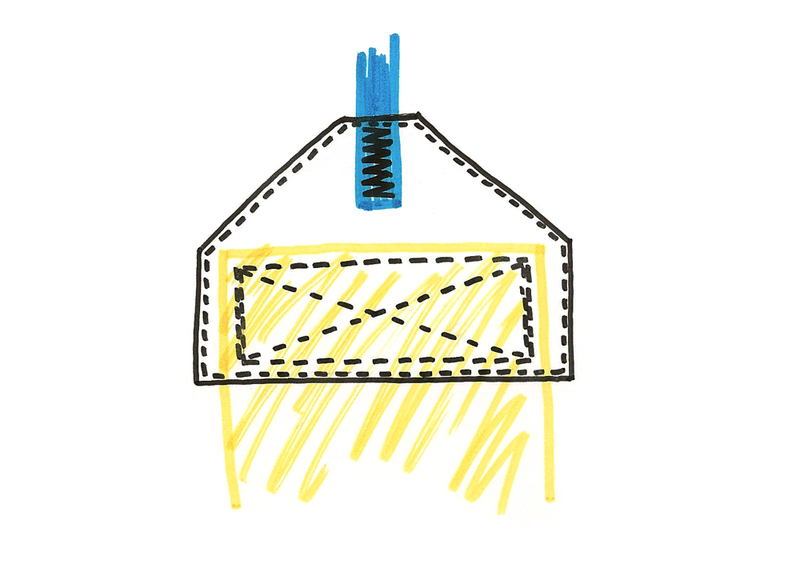 Sew a rectangle just inside the edges of the strap, basically as big as you can inside the area where the strap and end overlap while catching all the layers (illustrated above). When you get to the point where you started (this is the point with the curved arrow, where the illustrated stitches change from yellow to blue below), sew to the opposite corner. Keep going, overlapping the stitches on one side, then diagonally back to the other side. Overlap one side’s stitches again, to come back to where you started. Another way you can add stitches to an area that will get stress is to make a bar tack (that is the real name for this one) by using a wide stitch and a short stitch length. 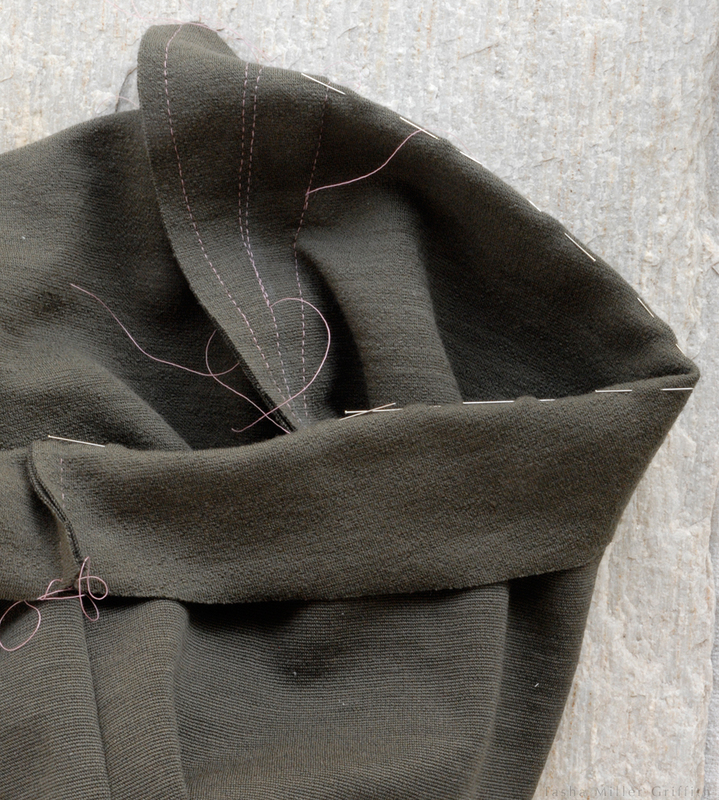 Just keep in mind that every time you make a stitch it also makes a hole in the material, so don’t make the stitches so close together that the holes touch and make a weak place where the material could tear. I used a mini version of the rectangle-and-X to attach the webbing to the ends. A bar tack would work well too. As usual, it’s a good idea to try out your planned techniques on some scraps to see what works. Once you’ve attached the strap and webbing to the ends, I like to sew around the edge of the ends to keep everything neat. Bury the thread ends wherever you can, and you’re done. I’m not a leather sewing expert, but I can give you a couple of tips if you decide to use real leather for the ends. 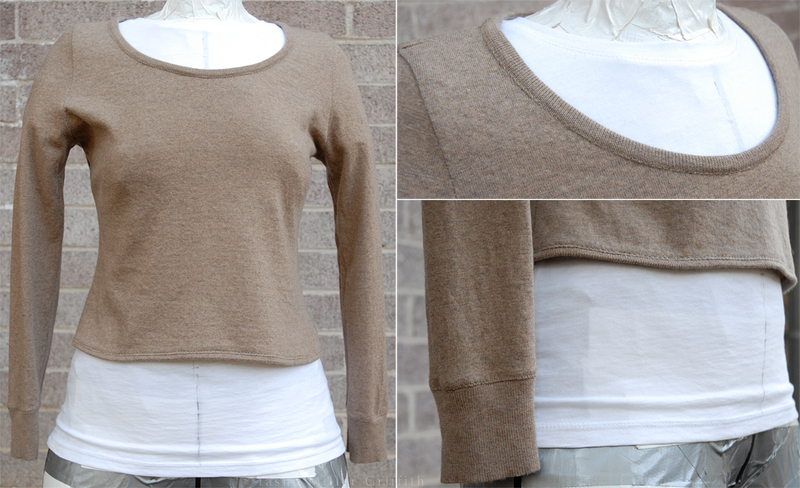 Although it’s more difficult to sew than the faux stuff, it’s wonderfully strong and malleable. First, you will definitely need a leather needle. The main difficulty is getting the machine to punch through the leather, and everything that would normally make your machine want to skip stitches (sewing over different thicknesses of materials, etc.) 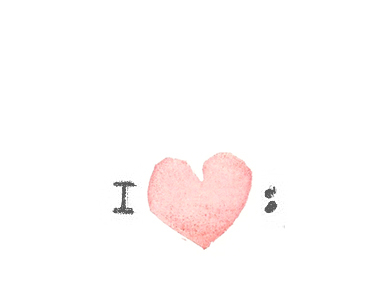 does so even more. Go slowly, go over skipped stitches again or pick up the foot and go back. Use the hand wheel if necessary, get the weight of the machine on your side. 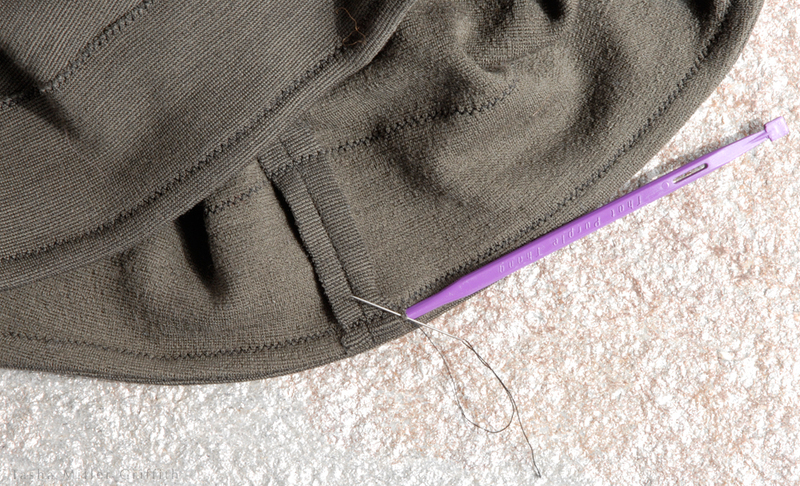 Try switching between a regular foot and a zipper foot to sew around the edges of the ends. I still ended up with some skipped stitches and broken/restarted threads to hide, but I was overall pleased with how my machine handled the leather and all the layers. It’s not much harder to make an adjustable strap, you just have to wrap your head around how it works. I’m such a visual learner, I need to draw it or better yet, lay out all the pieces to see how they’ll go together, as below. 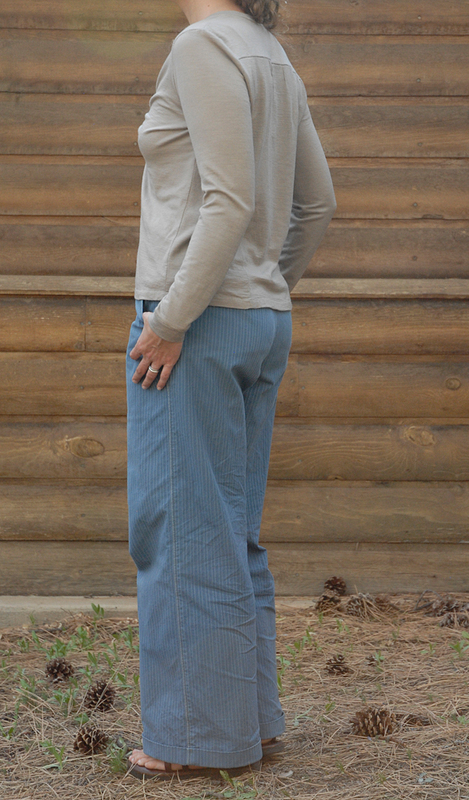 One side is a simple length of strap that goes through the loop and back to the end. The other side goes from the end, through the slider, through the loop, and back through the slider (inside the first pass). Sew the strap end down so that there’s a short loop of strap inside the slider, covering the raw edge with the extra suede piece. You can use the rectangle-and-X method again. Special thanks to Bryan’s first 35mm camera for modeling. A note if you’d like the strap to hug your shoulder like mine: I used two lengths of the strap fabric so that I could separate them to either side of my shoulder. It turns out that it works even if I don’t separate them—I think as long as your strap is fairly wide and soft it will work to wear it on your shoulder. Make any strap you want! Nice, right?